My name is Emily and myself and my husband Paul had our first child Evie on Sunday 17th November 2013. At the time we were living in Hong Kong and we were so excited by the thought of starting our new little family. I didn’t have an easy birth and after many hours I had an emergency C-section. I didn’t see Evie for nearly 2 hours after the birth as the doctors took her to be examined, as she was quite small, she weighed 6.2lbs, however they reassured me all was OK. After what felt like forever, finally myself and Paul were reunited and stared at our little girl and decided on her name Evie Kate, it was a special moment together, we loved her instantly. However, Evie had problems straight away feeding and didn’t latch on to be breast-fed. Early the next day one of the nurses called Wing who I will always remember, she was so kind, took Evie so I could sleep, I was exhausted. However, after an hour or so I kept waking and wanted to be with her, the nurse told me she had been taken to the special baby care unit, moments later a doctor arrived just as Paul had returned to see us, she told us there were some concerns with Evie and the paediatric team were examining her, they suspected a syndrome of some kind. I remember so clearly the doctor telling us this in a busy noisy ward, I felt sick straight away. Paul then left me to go to the unit to see Evie, I was still bed bound. It felt forever during the time he was gone and I cried continually. Eventually Paul returned in tears and said he had spoken to a very experienced consultant who said it was most likely Evie had Downs syndrome, we were devastated. I can’t explain those feelings in the first few days. Somehow I managed to get up and see Evie that morning, she looked so tiny in the incubator and helpless. I touched her little hand through the hole and told her she would be fine and mummy and daddy loved her and we had an exciting first Christmas planned for her in just a month’s time. The doctors took Paul and me aside and said they were certain she had downs due to key markings but had to run some tests. It was the hardest time coming to terms with this diagnosis, how little did I know that this was just the start. After a week in the special care unit, the doctor asked to see us, he actually had tears in his eyes and said the tests had come back negative and she didn’t have downs syndrome. The relief we felt was overwhelming! All three of us hugged. However, he did feel concerned still and said they would need to monitor Evie over the next few weeks, but we were allowed to go home. Looking back now, those first few weeks were a blur, as I think for most new mums, Evie still didn’t latch on and so it was a cycle of pumping milk, feeding, sleeping. Her milk intake was very small and always a concern to visiting midwifes and doctors. I think early on I did have a feeling maybe something wasn’t quite right with her, I can always remember puzzled looks on various midwifes and doctors we came across, but I desperately wanted her to be healthy and so pushed aside my worries. Concerns continued though and Evie undertook numerous tests, scans, and examinations during the first 4 months. She was still underweight, had failed two hearing tests, had issues with her sight, her thyroid did not function correctly, her liver was enlarged, she still had poor muscle tone, had wide fontanel’s and her head had an increased pressure on the base her of brain, but the doctors still had no diagnosis. Eventually one of the endocrine doctors in HK rang us at home on Sunday 17th march to tell us that Evie needed to be admitted the following day. Further blood tests and scans were taken and after several days, we were told Evie’s Diagnosis of Peroxisomal Biogenesis Disorder. The doctors explained that this was a very rare genetic metabolic disease and it would affect her whole development, but the main words that stuck in my head from the doctor was that it was life limiting and there was no cure. Paul was broken next to me, but I didn’t believe them and said they were wrong before and were probably wrong again. I think it probably took me nearly another 3 months to accept this news. We returned to the UK a few weeks later to see a medical specialist in Sheffield’s Children’s Hospital. Dr Mark Sharrard has been amazing with us and I can’t thank him enough. The hospital repeated tests and confirmed Evie’s Diagnosis. It was a difficult time for us, but the support from our friends and family was incredible and continues to keep us going. Evie has a profound hearing loss in her right ear, her left is severe and she has a small pink glittery hearing aid for this. The first fitting of this was so funny, her little face lit up! She has undertaken numerous sight tests and they have confirmed she has a severe visual impairment and it is likely she is blind, however she does react to bright lights and loves all kinds of sensory toys. Her muscle tone is still very weak and at present Evie cannot crawl, I have persevered with Physio and OT. Evie can roll, sit up and sometimes balance with help on her feet. Swimming has been fantastic for her. Her liver is still a worry as is the pressure on the top of her spine called stenosis C1 as this has increased and it is likely she will need an operation on this in the near future. 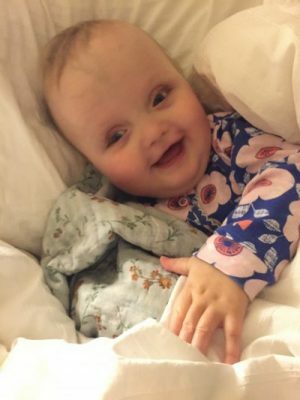 She has started to have seizures over the past 3 months, just before her second birthday. This has been the hardest part to help her with and understand ourselves but we are slowly getting there with the medication that can control them. She has numerous doses of medication throughout the day, which at first I found so difficult but now it has become routine. She is still on formula milk, I have been advised to use SMA toddler, she struggles with solids and swallowing and so her diet is predominantly milk based, but she is putting weight on, a feeding tube is something that looks likely though in the future. We now live back in the UK in York. The support for Evie here is incredible through our hospital, therapy teams and a local children’s hospice Martin House which have been amazing. As parents, you cannot describe the anxiety, stress and worry we have been through and continue to do so on a daily basis, but Evie is such a happy little girl, she is content and loves to be held and cuddled. She has amazed us how strong she has been through all of this and she makes us so proud. At first I felt I was just getting through each day, but the happiness she has brought us has been so immense that I cannot imagine life without her and things are slowly getting easier. We will do whatever we can to help her develop in her own way. She makes us smile every day, her giggles, her bubble blowing; she is one special little girl and has touched so many hearts. She has a little security toy of rings; I hope I never loose these, as it’s the first and last thing she holds in the day!